Just days before Saudi Arabia’s mass execution of 47 people, the US announced the approval of more military contracts with the Gulf kingdom. The executions caused global outrage and increased tensions with Iran, due to the killing of revered Sheik and scholar Nimr al-Nimr. His death sparked protests across the region as Shiite Muslims expressed anger at the execution of the cleric who stood against violence. Three of those executed were also teenagers at the time of their arrest. The latest contracts between the US and Saudi Arabia include US$24 million for Raytheon Company, $12 million to Advanced Electronics and millions more for Boeing’s laser air-to-ground weapons system. When President Barack Obama first announced the US$1.29 billion deal for 18,000 bombs and 1,500 warheads late last year, Amnesty International and other groups called on him to cancel them since this violated the UN Arms Trade Treaty, which forbids the sale of weapons when there is knowledge the weapons will be used against civilians. "Given the evidence of how Saudi Arabia has employed such arms to date, there is overwhelming reason for concern that Saudi Arabia will use such arms to commit serious violations of international humanitarian law in Yemen," Michael O'Reilly from Amnesty’s US branch warned on December 10. "We urge President Obama to cancel this deal." Saudi Arabia, which carried out more than 157 beheadings in 2015, according to the AP's tally, provides a rich market for US and UK arms manufacturers. The US supports the Saudis in their war against Yemen as part of the coalition. They provide assistance through intelligence, training, refueling and weapons. More than 2,000 civilians have been killed since the airstrikes began in late March. "@RT_com: #SaudiArabian coalition given ‘free pass’ on #Yemen war for money - UN human rights chief https://t.co/1T1mQSywBm "
Saudi’s air strikes in Yemen are not void of civilian casualties. More than 100 attacks on hospitals have been documented by the International Committee of the Red Cross. Following the mass executions, the US State Department released a statement saying Washington "frequently raised" concerns about the legal process in Saudi Arabia with Riyadh's top officials. 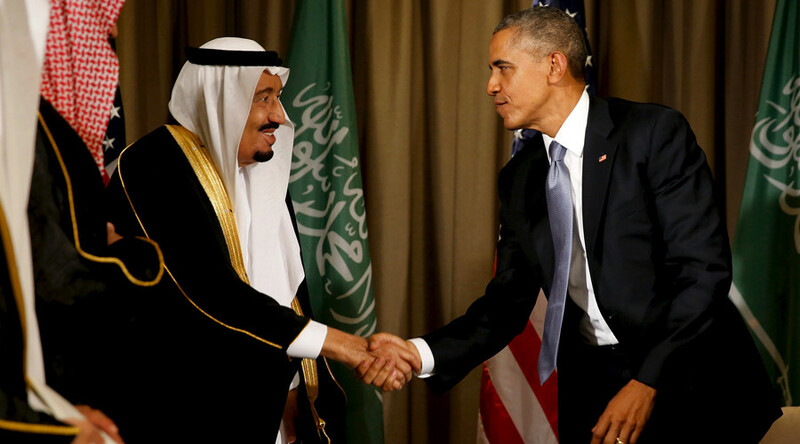 "We reaffirm our calls on the Government of Saudi Arabia to respect and protect human rights, and to ensure fair and transparent judicial proceedings in all cases," the State Department said calling on Riyadh to "work together with all community leaders to defuse tensions in the wake of these executions.‎"
The House of Saud funds American politicians, lobbying groups, PACs, and media companies, employing a well-funded PR machine through companies like Edelman to influence US opinion. The Clinton Foundation also receives funding from the Kingdom, as do a number of universities and think tanks, as reported by The Intercept.